We’re all for copyright protection—but there are limits. The song “Happy Birthday to You” is such an iconic part of our culture that it often surprises people to hear that a company claims copyright in the song and that royalties may be due for using it in a television show or movie. Now, a newly uncovered piece of evidence in a legal dispute surrounding the song’s copyright could validate the common intuition that “Happy Birthday” belongs in the public domain. The copyright in “Happy Birthday to You” has been held since 1988 by the Warner Music Group, which has rigorously enforced the copyright when the song has been used commercially, especially in film, television, and advertising. And “Happy Birthday” has been a cash cow for Warner: Copyright scholar Robert Brauneis estimated that it generates around $2 million a year in licensing fees. Not surprisingly, this hasn’t sat well with creators wishing to use the song in new works. Filmmaker Jennifer Nelson, for example, was making a documentary about the song and found out Warner was charging her $1,500 to use it in her film. So Nelson filed a lawsuit. But in this recent case, Good Morning to You Productions v. Warner/Chapell Music, the plaintiffs’ lawyers claim to have a “smoking gun” that could determine once and for all the song’s public domain status. 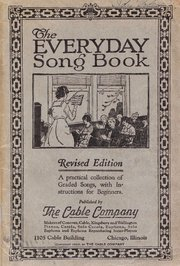 Recently they made a court filing stating that they’ve found a 1922 songbook containing a number called “Good Morning and Birthday Song,” whose third verse is the exact verse we sing to this day. This could finally settle the matter for two reasons. First, the 1922 song was published without a copyright notice. According to the law of the day, publication without a copyright notice amounted to an abandonment of copyright. And, in any event, anything first published in the U.S. before 1923 is in the public domain in this country. The litigation is currently in a pre-trial phase in a California District Court, and Warner, it appears, will face an uphill battle going forward. Such overreaching claims of ownership give copyright a bad name. Copyright law exists to spur the production of new works and to make sure creators are compensated for those works when the free market values them; its misuse only provides more fodder for those who seek to undermine copyright. Photo credit: 1922 illustration, submitted as evidence by Wolf Haldenstein, the plaintiffs’ law firm.